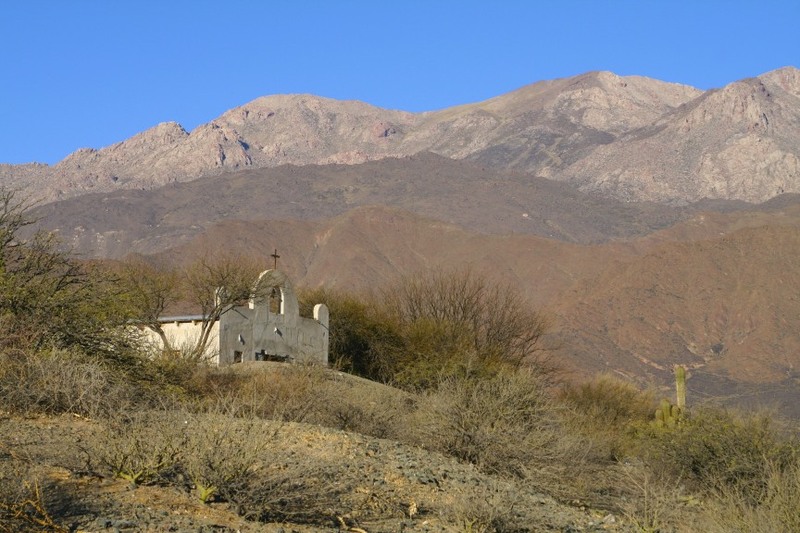 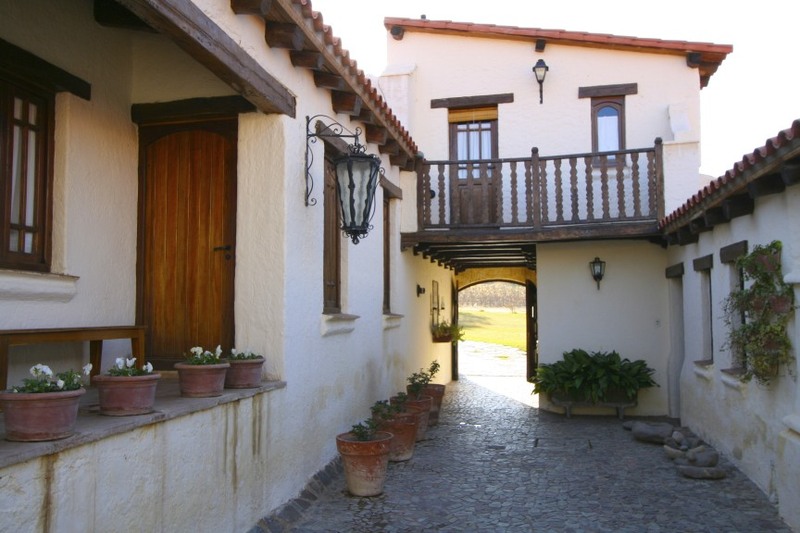 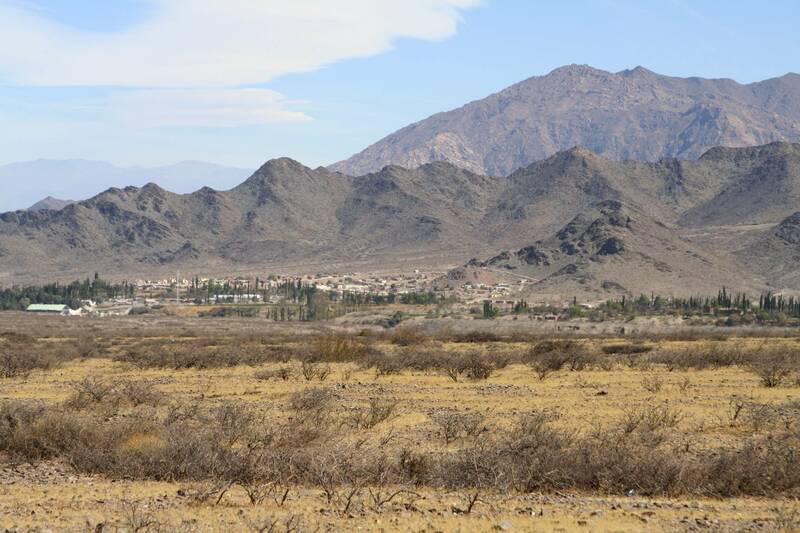 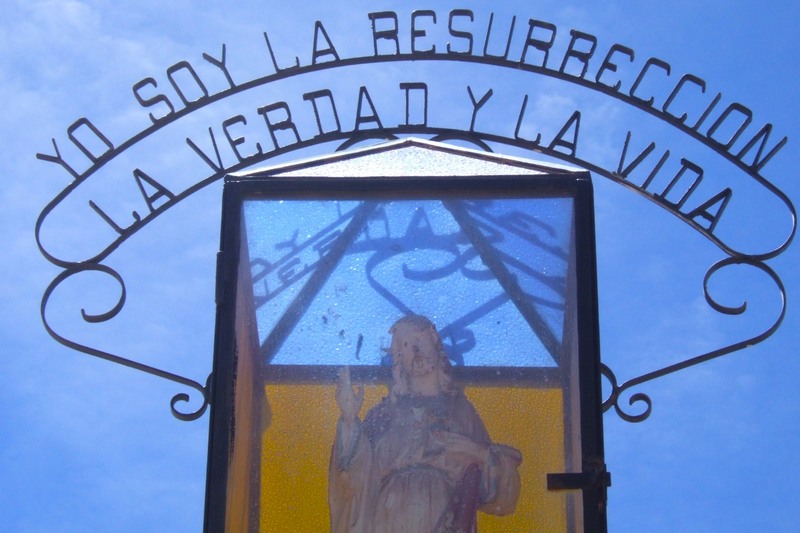 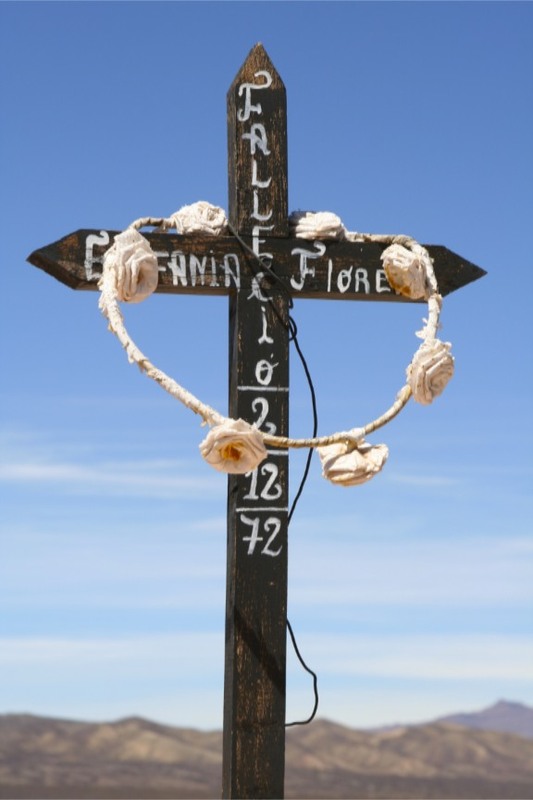 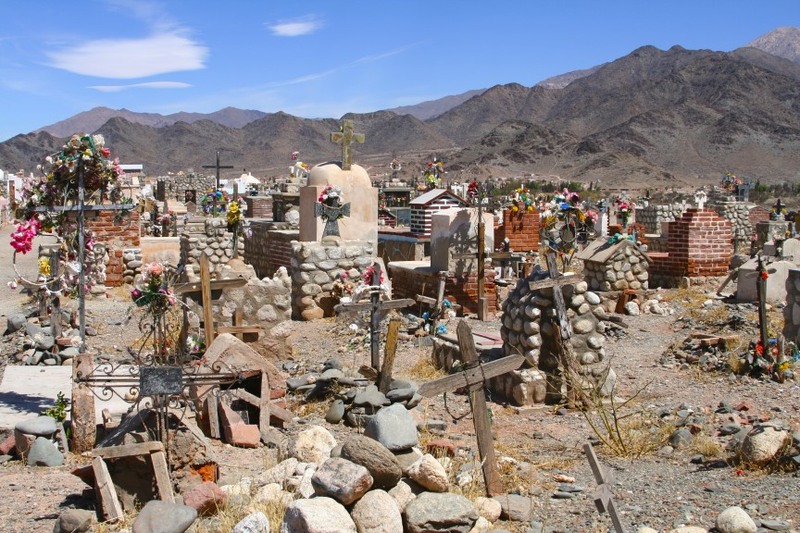 If the route to Cachi over the twisting mountain roads of the Cuesta del Obispo is dramatic, so is the setting of this beautiful and tranquil village. 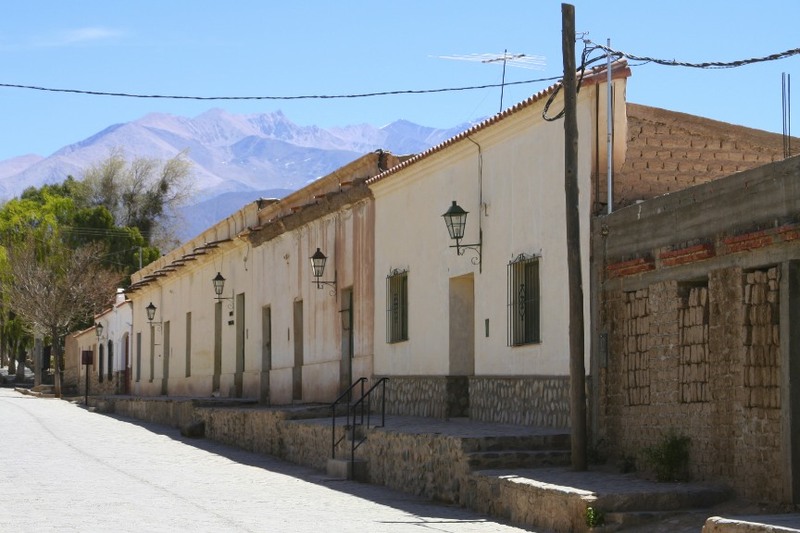 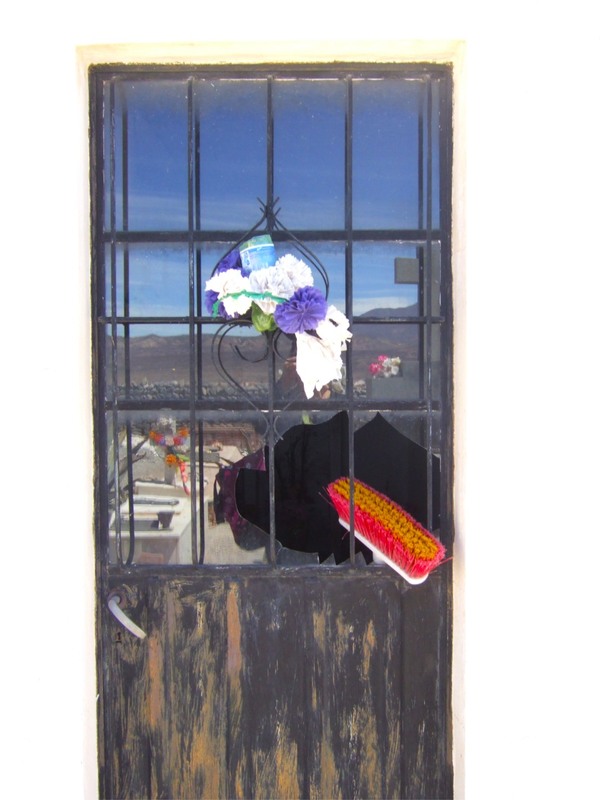 Located at 2280 meters above sea level, Cachi’s colonial-era architecture has a fabulous mountainous backdrop, including the 6380m Nevado del Cachi. 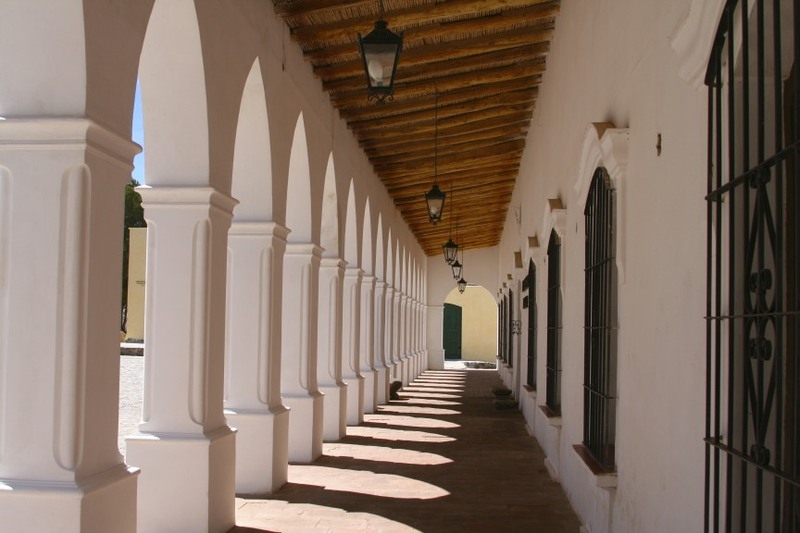 Arriving in the lovely Plaza Mayor under a bright blue sky and a blisteringly hot sun, we found an open restaurant took a seat under a shady palm tree and sat down to enjoy a cold drink and the peace-and-quiet of the village. 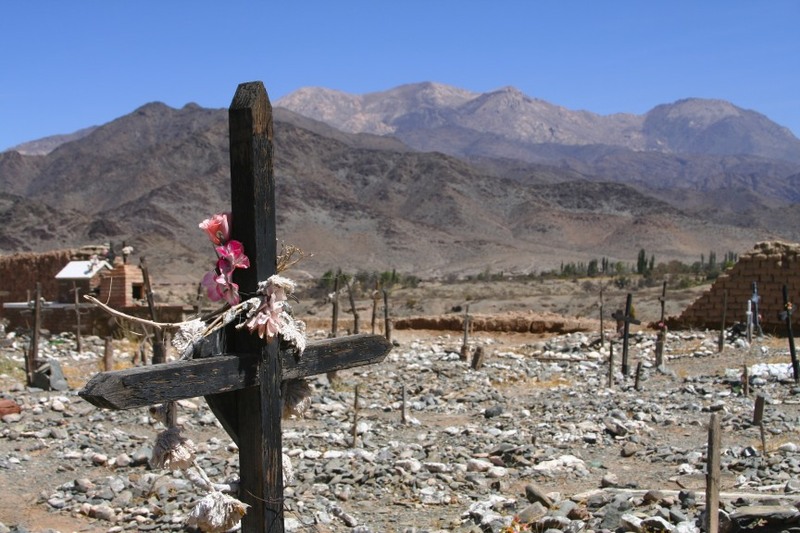 Apart from the occasional tour group from Salta, Cachi doesn’t seem to see much tourism and the streets are mercifully devoid of cars and buses. 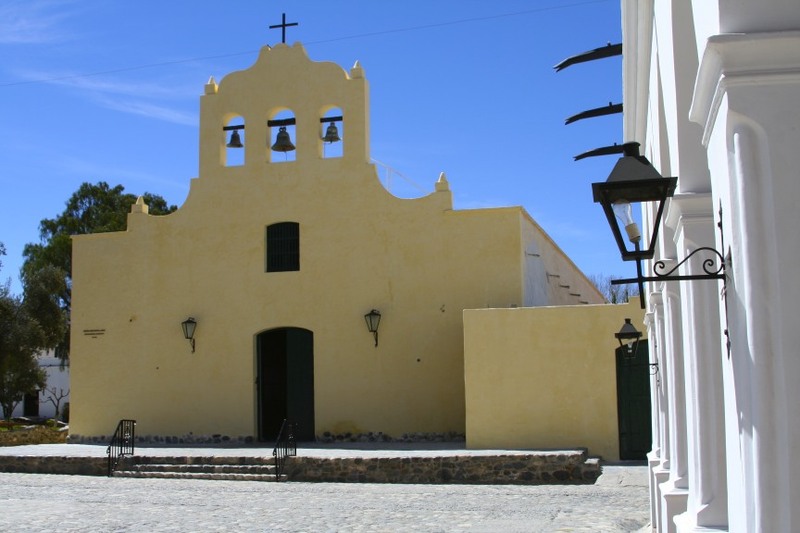 A stroll around the empty streets brought us to the delightful Iglesia San Jose on the plaza, which not only has pews made from cardone wood but the alta is constructed from cardone as well – and that is why these incredibly slow growing plants are now protected. 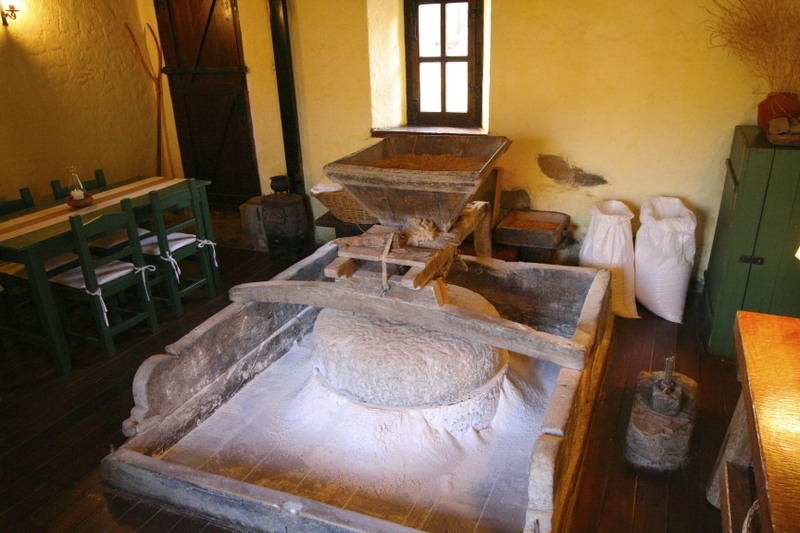 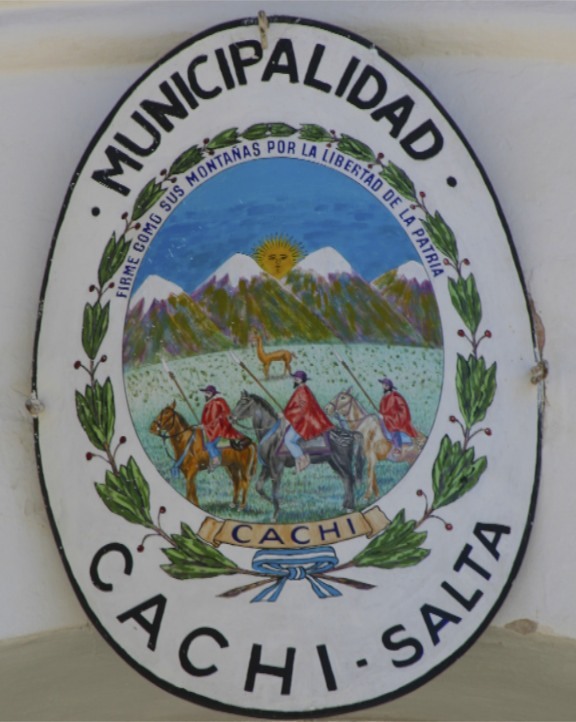 Once you’ve wandered around for a bit, had a bite to eat and checked out the couple of artisanal shops in town, there isn’t a great deal to do in Cachi. 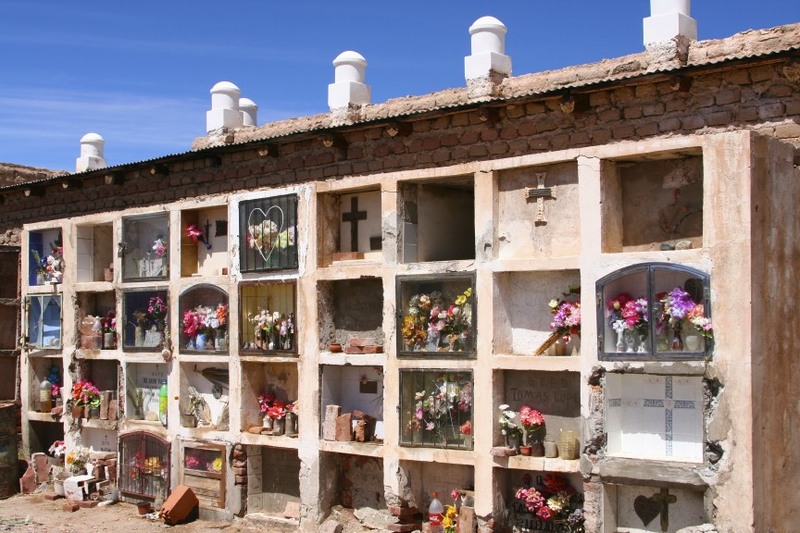 However, there is a picturesque and dramatically located cemetery not too far from the centre of town that is well worth visiting. 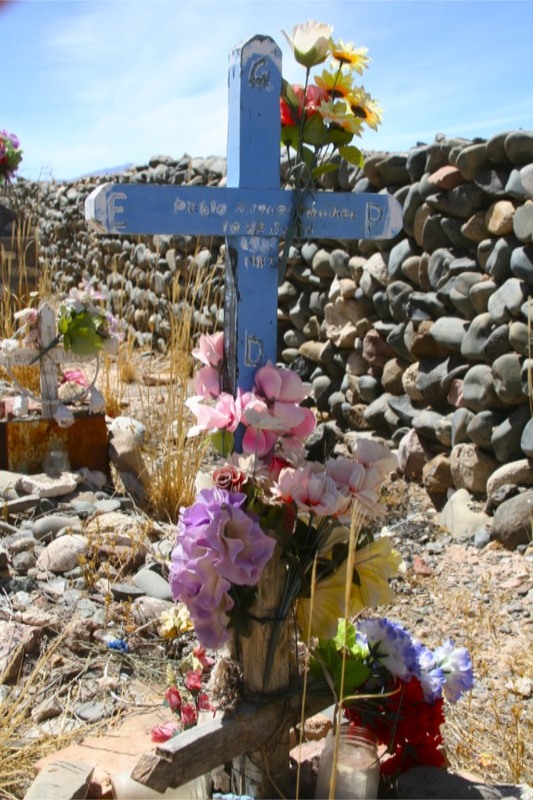 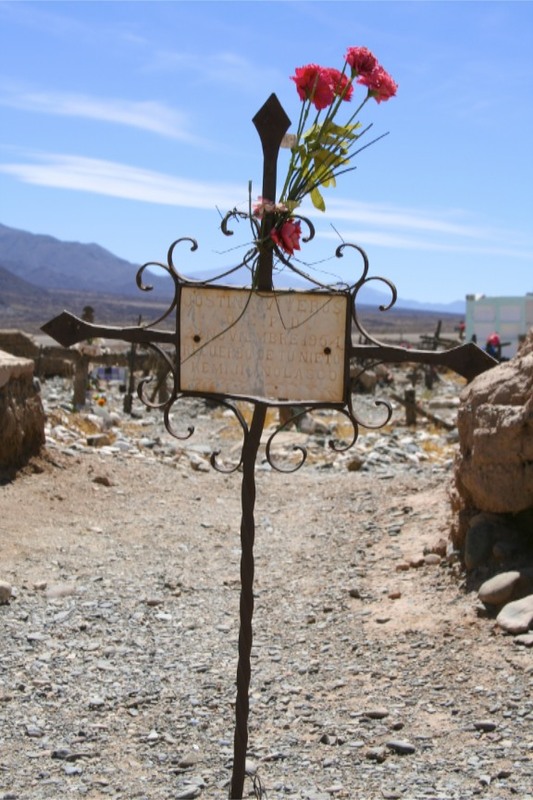 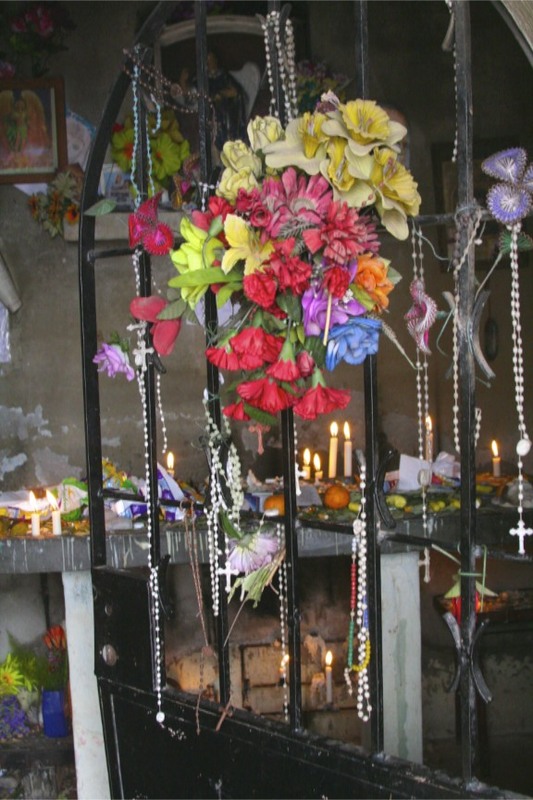 The colourful graves, adorned with plastic flowers, offer a stark contrast to the surrounding browns. 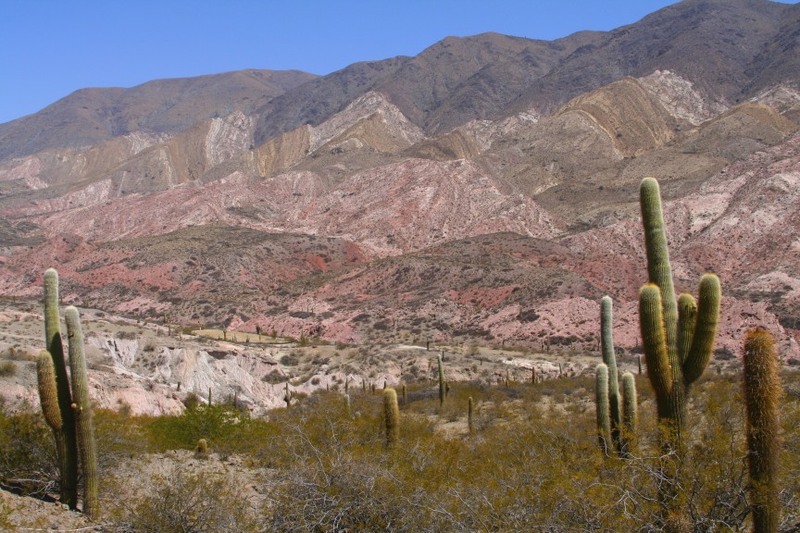 To describe the drive from Salta to the beautiful colonial village of Cachi, a journey which takes you through the Parque Nacional Los Cardones, as anything less than stunning would be to do it a serious disservice. 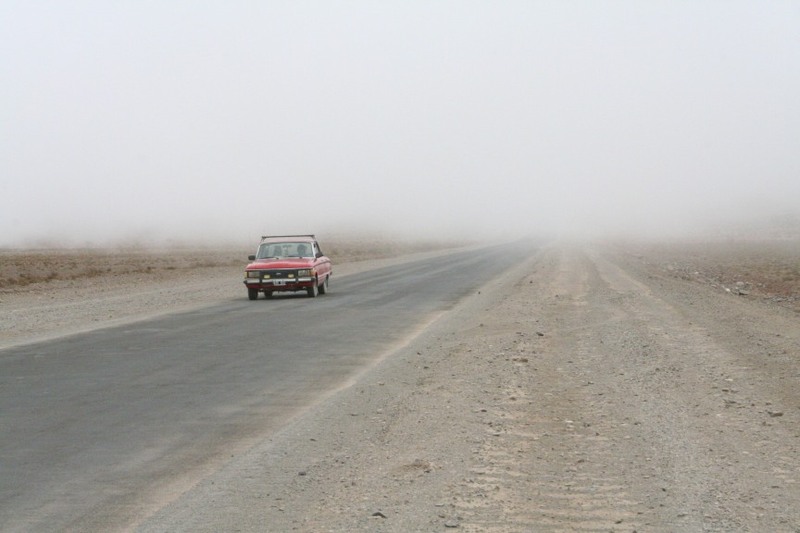 It has to count as one of the most dramatic landscapes I’ve travelled through. 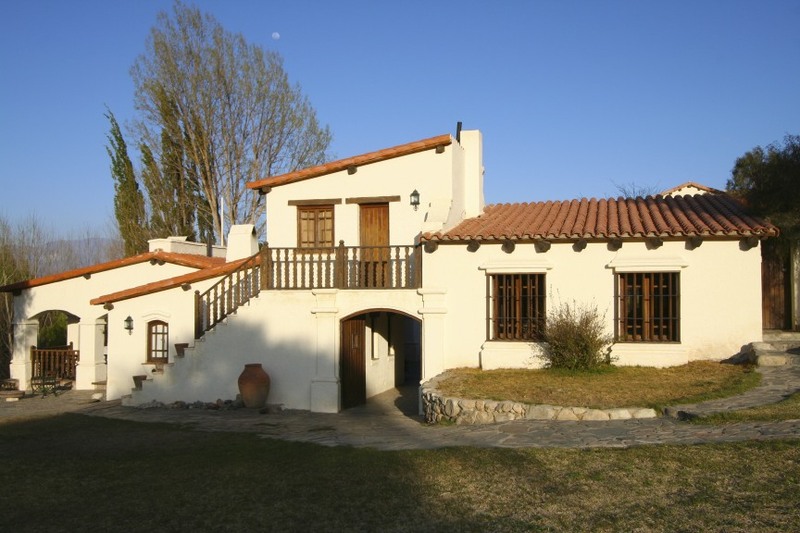 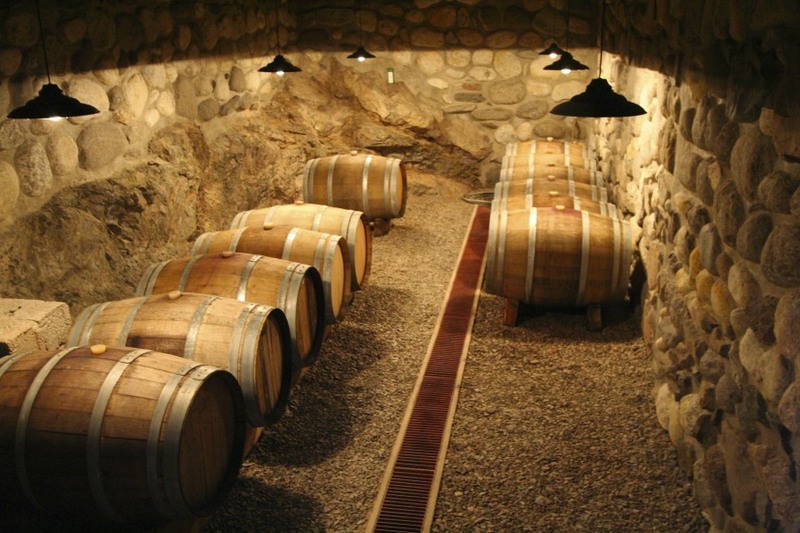 The reward for making the journey was a couple of nights staying at a hacienda that produces its own wine set amidst beautiful high altitude landscapes. 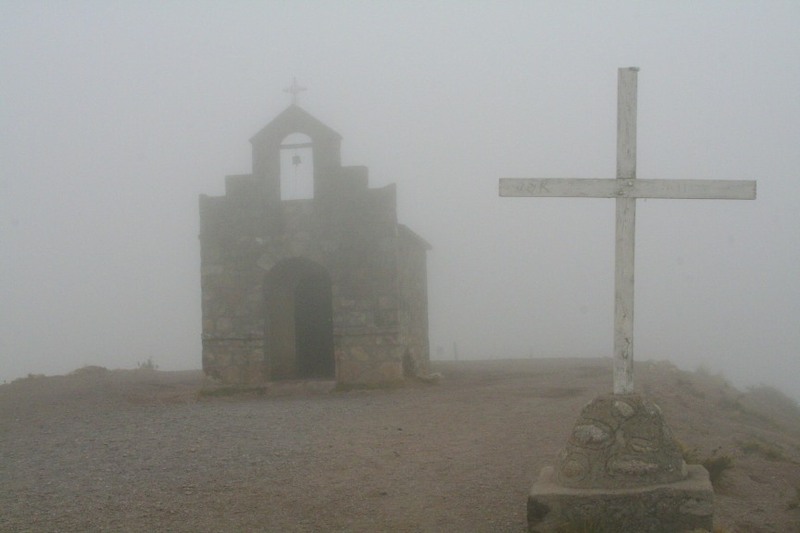 After driving for a couple of hours on a gravel road over a mountain range in heavy early morning mist, we finally arrived at the boundary of the Parque Nacional Los Cardones and, a little further on, a small chapel which had clearly seen a lot use from people driving over the mountains. 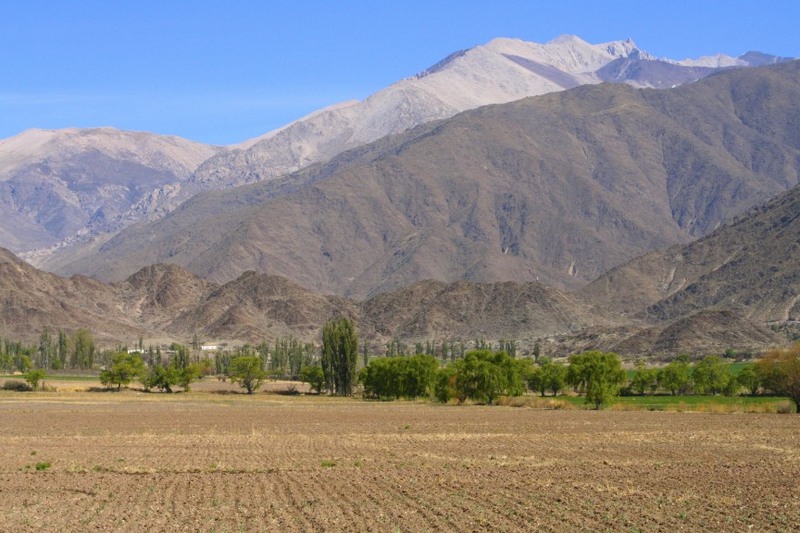 We were beginning to wonder whether we’d actually get to see any of the landscape, but finally we started to drop down the other side of the mountain range and into an entirely different climate with brilliant sunshine and blue skies. 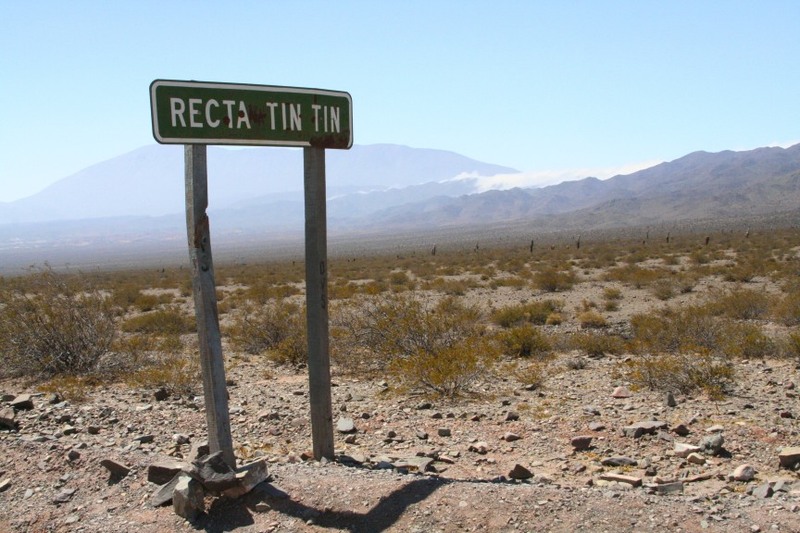 We also entered the most dramatic part of the Parque Nacional, with literally hundreds of cardone cacti scattered across the landscape and a stretch of road – the Recta Tin Tin – which is dead straight for about 10km and which, thanks to an optical illusion, looks like you are going down hill when you are going up. 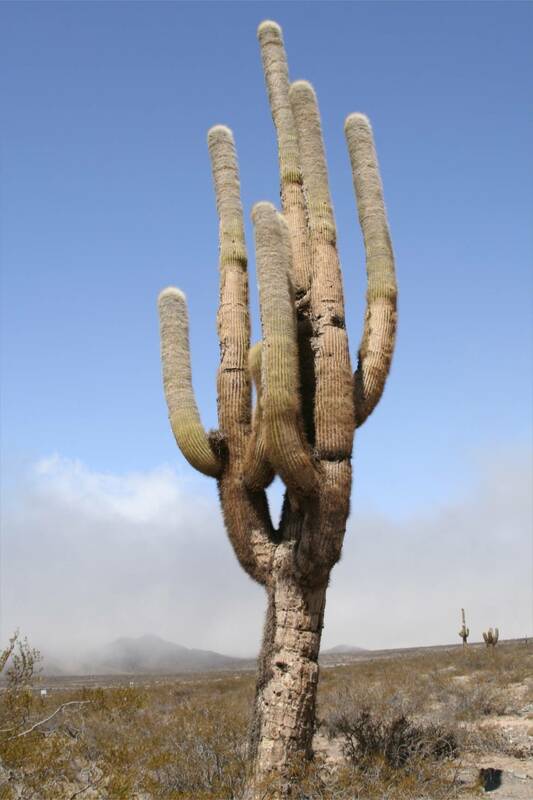 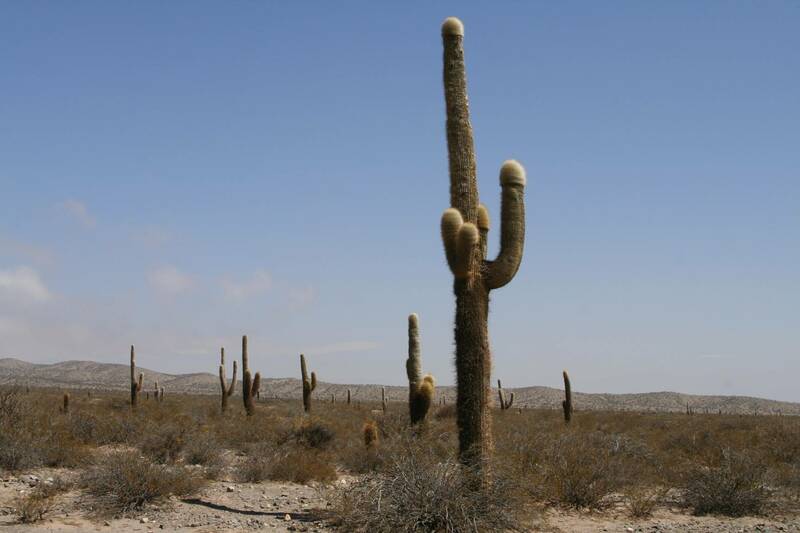 These beautiful cacti are now protected, a necessary precaution in an area where trees are few and far between and the wood of the cardones was used for most buildings and furniture. 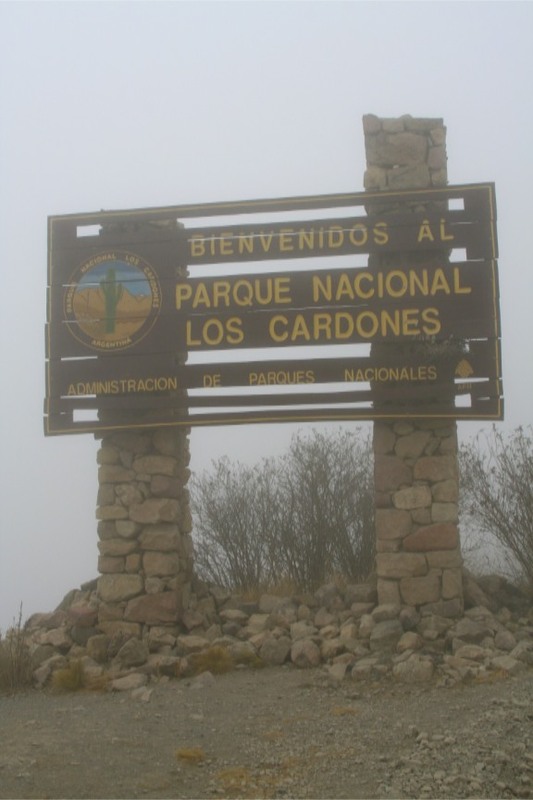 After all, cardones grow at little more than 2mm per year, chop one down and you have to wait a long, long time for it to be replaced. 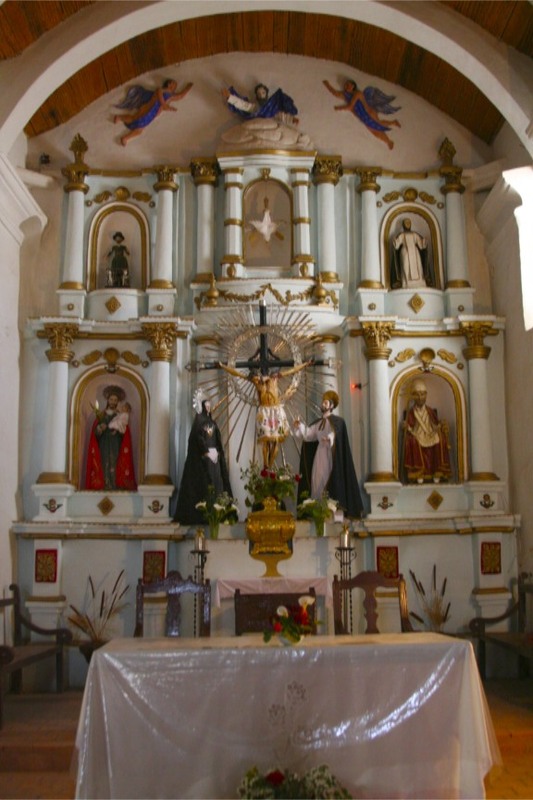 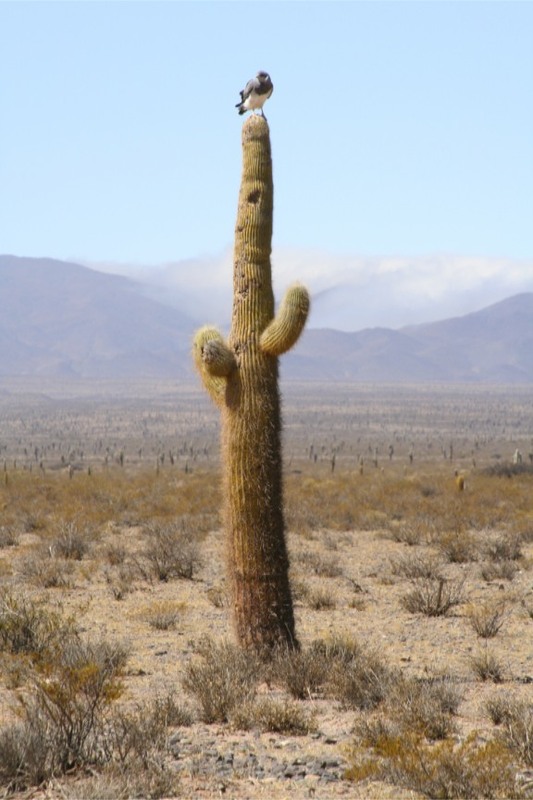 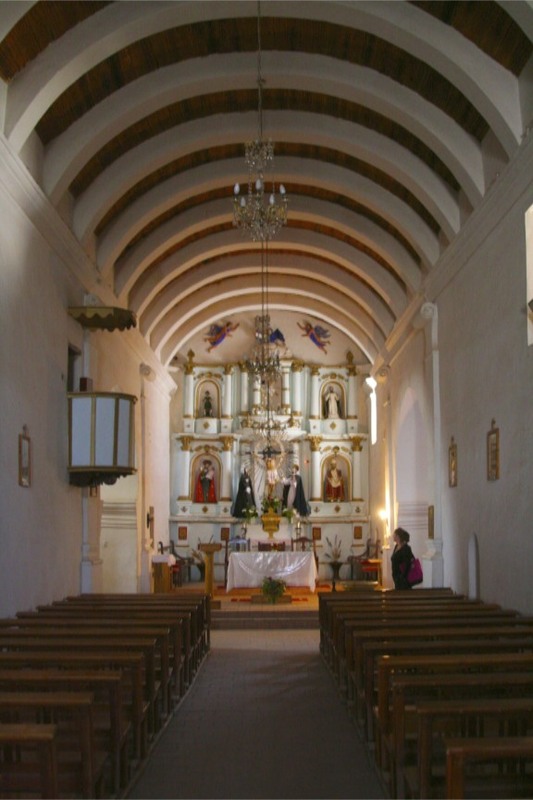 In some colonial-era churches you can still see the pews made from cardone wood – the tell-tale sign is the small holes in the wood where the cacti spikes were once attached. 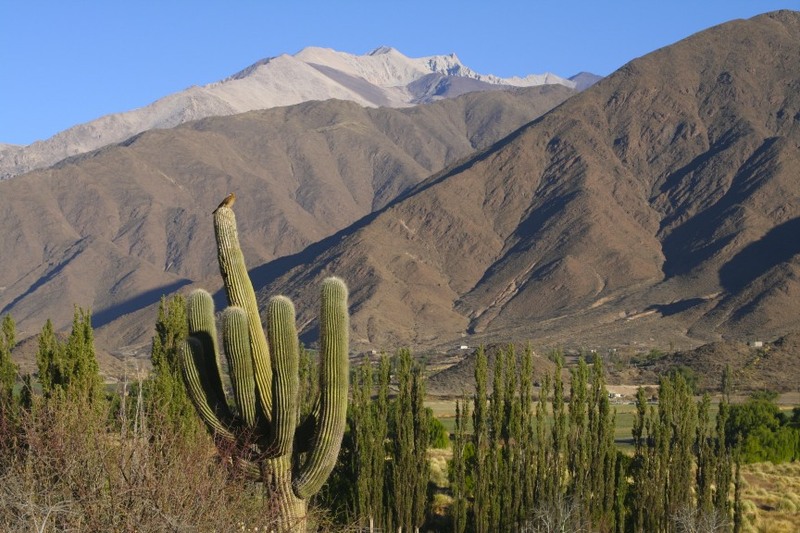 Arriving in Cachi as the sun began to set we sped on in the hope of reaching the Bodega El Molino de Cachi, one of the most beautiful places I’ve ever stayed and where we’d be relaxing for the next couple of days, before darkness fell. 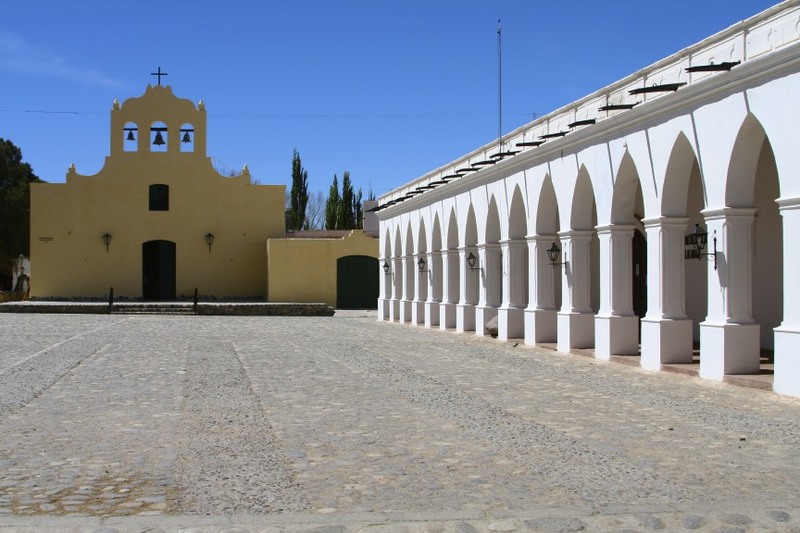 Family run, the hacienda is set is a fantastic landscape, the food is delicious and you can wash it down with wine made in the bodega. 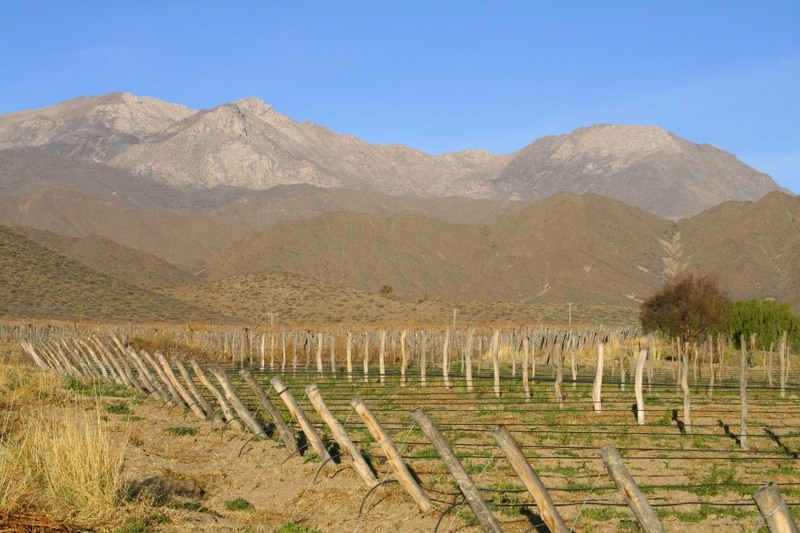 After a very peaceful night’s sleep, an early morning walk through the grounds and vineyards was rewarded by sublime views over the surrounding mountain ranges. 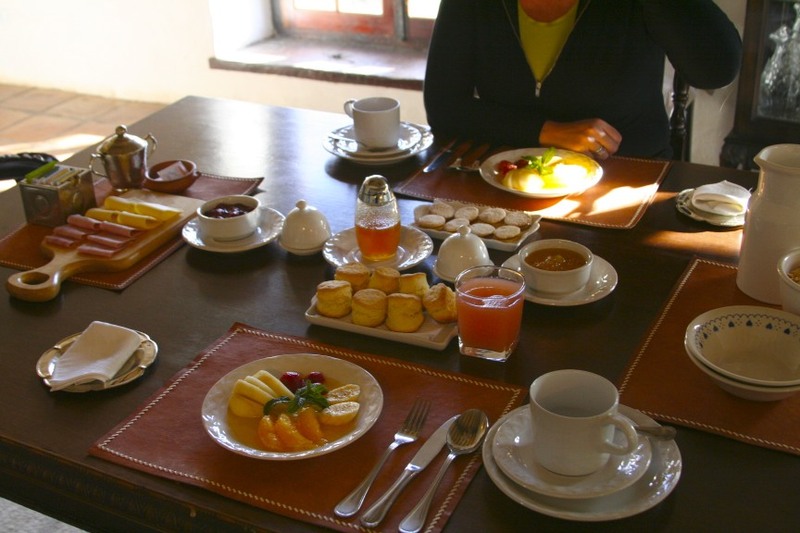 All topped off with a delicious breakfast.